The Black Sea is a body of water between Southeastern Europe and Western Asia, bounded by Bulgaria, Georgia, Romania, Russia, Turkey, and Ukraine. It is supplied by a number of major rivers, such as the Danube, Dnieper, Rioni, Southern Bug, and Dniester. The Black Sea has an area of 436,400 km2 (168,500 sq mi) (not including the Sea of Azov), a maximum depth of 2,212 m (7,257 ft), and a volume of 547,000 km3 (131,000 cu mi). It is constrained by the Pontic Mountains to the south and by the Caucasus Mountains to the east, and features a wide shelf to the northwest. The longest east-west extent is about 1,175 km (730 mi). Important cities along the coast include Batumi, Burgas, Constanța, Giresun, Hopa, Istanbul, Kerch, Mangalia, Năvodari, Novorossiysk, Odessa, Ordu, Poti, Rize, Sinop, Samsun, Sevastopol, Sochi, Sozopol, Sukhumi, Trabzon, Varna, Yalta and Zonguldak. The Black Sea has a positive water balance; that is, a net outflow of water 300 km3 (72 cu mi) per year through the Bosphorus and the Dardanelles into the Aegean Sea. 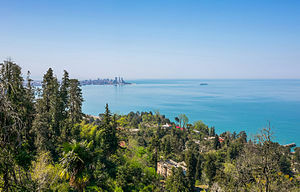 Mediterranean water flows into the Black Sea as part of a two-way hydrological exchange. The Black Sea outflow is cooler and less saline, and floats over the warm, more saline Mediterranean inflow – as a result of differences in density caused by differences in salinity – leading to a significant anoxic layer well below the surface waters. The Black Sea drains into the Mediterranean Sea and then the Atlantic Ocean, via the Aegean Sea and various straits. 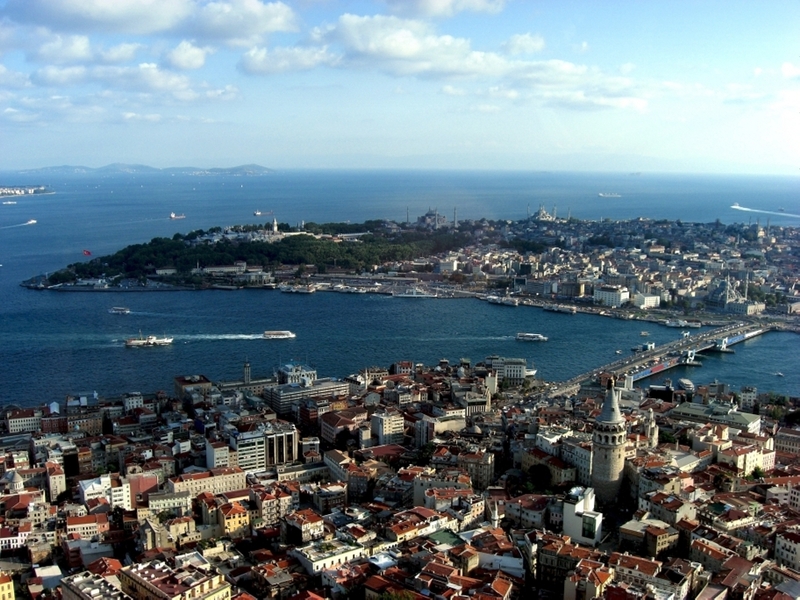 The Bosphorus Strait connects it to the Sea of Marmara, and the Strait of the Dardanelles connects that sea to the Aegean Sea region of the Mediterranean. These waters separate Eastern Europe and Western Asia. The Black Sea is also connected to the Sea of Azov by the Strait of Kerch. The water level has varied significantly. Due to these variations in the water level in the basin, the surrounding shelf and associated aprons have sometimes been land. At certain critical water levels it is possible for connections with surrounding water bodies to become established. It is through the most active of these connective routes, the Turkish Straits, that the Black Sea joins the world ocean. When this hydrological link is not present, the Black Sea is an endorheic basin, operating independently of the global ocean system, like the Caspian Sea for example. Currently the Black Sea water level is relatively high, thus water is being exchanged with the Mediterranean. The Turkish Straits connect the Black Sea with the Aegean Sea, and comprise the Bosphorus, the Sea of Marmara and the Dardanelles. Laz: Ucha zugha (უჩა ზუღა), or simply Zugha (ზუღა) "Sea"
Such names have not yet been shown conclusively to predate the 12th century, but there are indications that they may be considerably older. Strabo's Geographica (1.2.10) reports that in antiquity, the Black Sea was often just called "the Sea" (ὁ πόντος ho pontos). For the most part, Graeco-Roman tradition refers to the Black Sea as the "Hospitable sea", Εὔξεινος Πόντος Eúxeinos Póntos. This is a euphemism replacing an earlier "Inhospitable Sea", Πόντος Ἄξεινος Póntos Áxeinos, first attested in Pindar (c. 475 BC). Strabo (7.3.6) thinks that the Black Sea was called "inhospitable" before Greek colonization because it was difficult to navigate, and because its shores were inhabited by savage tribes. The name was changed to "hospitable" after the Milesians had colonized the southern shoreline, the Pontus, making it part of Greek civilization. It is also possible that the epithet Áxeinos arose by popular etymology from a Scythian word axšaina- "unlit", "dark"; the designation "Black Sea" may thus date from antiquity. A map of Asia dating to 1570, entitled "Asiae Nova Descriptio", from Abraham Ortelius's Theatrum Orbis Terrarum, labels the sea Mar Maggior ("Great Sea", cf. Latin mare major). 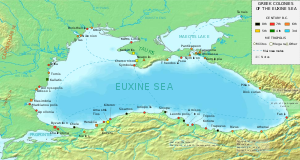 English-language writers of the 18th century often used the name "Euxine Sea" ( /ˈjuːksɪn/ or /ˈjuːkˌsaɪn/) to refer to the Black Sea. Edward Gibbon, for instance, calls the sea by this name throughout The History of the Decline and Fall of the Roman Empire. During the ottoman empire period, the Black Sea was called either Bahr-e Siyah or Karadeniz, both meaning "the Black Sea" in the Ottoman Turkish. It is worthy to note, that in the tenth-century geography book Hudud al-'Alam, written in the Persian language by an unknown author, the Black Sea is called "Georgian Sea", "Sea of Georgians" ("daryä-yi Gurziyan"). Old Georgian sources of 9th-14th centuries ("The Georgian Chronicles") were using the name "Speris Zğua" (სპერის ზღუა), which means "The Sea of Speri", after the name of Kartvelian tribe Speris or Saspers, now in Turkey. The Black Sea is a marginal sea  and is the world's largest body of water with a meromictic basin. The deep waters do not mix with the upper layers of water that receive oxygen from the atmosphere. As a result, over 90% of the deeper Black Sea volume is anoxic water. The Black Sea's circulation patterns are primarily controlled by basin topography and fluvial inputs, which result in a strongly stratified vertical structure. Because of the extreme stratification, it is classified as a salt wedge estuary. The Black Sea only experiences water transfer with the Mediterranean Sea, so all inflow and outflow occurs in the Bosphorus and Dardanelles. Inflow from the Mediterranean has a higher salinity and density than the outflow, creating the classical estuarine circulation. This means that inflow of dense water from Mediterranean occurs at the bottom of the basin while outflow of fresher Black Sea surface-water into the Marmara Sea occurs near the surface. Fresher surface water is the product of the fluvial inputs, and this makes the Black Sea a positive sea. The net input of freshwater creates an outflow volume about twice that of the inflow. Evaporation and precipitation are roughly equal at about Template:Convert/km3/year. Modelling shows the release of the hydrogen sulphide clouds in the event of an asteroid impact into the Black Sea would pose a threat to health—or even life—for people living on the Black Sea coast. There have been isolated reports of flares on the Black Sea occurring during thunderstorms, possibly caused by lighting igniting combustible gas seeping up from the lake depths. Marine mammals present within the basin include two species of dolphins (common and bottlenose) and harbour porpoise inhabit the sea although all of these are endangered due to pressures and impacts by human activities. All the three species have been classified as a distinct subspecies from those in the Mediterranean and in Atlantic Seas and endemic to Black and Azov Seas. Critically endangered Mediterranean monk seals were historically abundant in Black Sea, and are regarded to have become extinct from the basin since in 1997. Monk seals were present at the Snake Island until 1950s, and several locations such as the Danube plavni nature reserve and Doğankent were last of hauling-out sites in post-1990. Very few animals still thrive in the Sea of Marmara. Various species of pinnipeds, sea otter, and beluga whales were introduced into Black Sea by mankind and later escaped either by accidental or purported causes. Of these, grey seal and beluga whales have been recorded with successful, long-term occurrences. There is also evidence that water levels in the Black Sea were considerably lower at some point during the post-glacial period. Thus, for example, archaeologists found fresh-water snail shells and man-made structures in roughly 100 m (330 ft) of water off the Black Sea coast of modern Turkey. Therefore, it is agreed that the Black Sea had been a landlocked freshwater lake (at least in upper layers) during the last glaciation and for some time after. The oldest processed gold in the world was found in Varna, and the Black Sea was supposedly sailed by the Argonauts. The land at the eastern end of the Black Sea, Colchis, (now Georgia), marked for the Greeks the edge of the known world. Ancient trade routes in the region are currently being extensively studied by scientists, as the Black Sea was sailed by Hittites, Carians, Colchians Thracians, Greeks, Persians, Cimmerians, Scythians, Romans, Byzantines, Goths, Huns, Avars, Bulgars, Slavs, Varangians, Crusaders, Venetians, Genoese, Lithuanians, Georgians, Poles, Tatars, Ottomans, and Russians. ^ a b Abkhazia has been a de facto independent republic since 1992, although remains a de jure autonomous republic of Georgia. ^ UNEP/GRID-Arendal Maps and Graphics Library (2001). "Socio-economic indicators for the countries of the Black Sea basin". http://maps.grida.no/go/graphic/sosio_economic_indicators_for_the_countries_of_the_black_sea_basin_giwa. Retrieved December 11, 2010. ^ Surface Area—"Black Sea Geography". University of Delaware College of Marine Studies. 2003. https://www.ceoe.udel.edu/blacksea/geography/index.html. Retrieved April 3, 2014. ^ Maximum Depth—"Europa – Gateway of the European Union Website". Environment and Enlargement – The Black Sea: Facts and Figures. http://ec.europa.eu/environment/enlarg/blackseafactsfigures_en.htm. ^ "Unexpected changes in the oxic/anoxic interface in the Black Sea". Nature Publishing Group. March 30, 1989. http://www.nature.com/nature/journal/v338/n6214/abs/338411a0.html. Retrieved December 2, 2006. ^ "Limits of Oceans and Seas, 3rd edition". International Hydrographic Organization. 1953. http://www.iho-ohi.net/iho_pubs/standard/S-23/S23_1953.pdf. Retrieved February 7, 2010. ^ "Turkish Statistical Institute". Rapor.tuik.gov.tr. http://rapor.tuik.gov.tr/reports/rwservlet?adnksdb2&ENVID=adnksdb2Env&report=wa_turkiye_ilce_koy_sehir.RDF&p_il1=34&p_kod=1&p_yil=2011&p_dil=1&desformat=html. Retrieved January 14, 2014. ^ "Turkish Statistical Institute". Rapor.tuik.gov.tr. http://rapor.tuik.gov.tr/reports/rwservlet?adnksdb2&ENVID=adnksdb2Env&report=wa_turkiye_ilce_koy_sehir.RDF&p_il1=55&p_kod=1&p_yil=2011&p_dil=1&desformat=html. Retrieved January 14, 2014. ^ Annexation of Crimea by the Russian Federation, Wikipedia. ^ "Turkish Statistical Institute". Rapor.tuik.gov.tr. http://rapor.tuik.gov.tr/reports/rwservlet?adnksdb2&ENVID=adnksdb2Env&report=wa_turkiye_ilce_koy_sehir.RDF&p_il1=61&p_kod=1&p_yil=2011&p_dil=1&desformat=html. Retrieved January 14, 2014. ^ Stiati.ca. "Cele mai mari orase din Romania". Stiati.ca. http://stiati.ca/cele-mai-mari-orase-din-romania/. Retrieved January 14, 2014. ^ "Turkish Statistical Institute". Rapor.tuik.gov.tr. http://rapor.tuik.gov.tr/reports/rwservlet?adnksdb2&ENVID=adnksdb2Env&report=wa_turkiye_ilce_koy_sehir.RDF&p_il1=67&p_ilce1=1741&p_kod=2&p_yil=2011&p_dil=1&desformat=html. Retrieved January 14, 2014. ^ "Batumi City Hall website". http://www.batumi.ge. http://www.batumi.ge/en/. Retrieved 2012. ^ Özhan Öztürk (2005). Karadeniz Ansiklopedik Sözlük. İstanbul: Heyamola Yayınları. pp. 617–620. http://www.karalahana.com/makaleler/karadeniz/karadeniz-ozhan-ozturk.htm. ^ Gibbon, Edward. The History of the Decline and Fall of the Roman Empire. Everyman's Library, 1910; reprinted 1993. ISBN 0-679-42308-7. Passim. ^ (1970) "Plate tectonics of the Mediterranean region". Nature 226 (5242): 239–43. DOI:10.1038/226239a0. PMID 16057188. ^ McClusky, S. (2000). "Global Positioning System constraints on plate kinematics and dynamics in the eastern Mediterranean and Caucasus". Journal of Geophysical Research 105 (B3): 5695–5719. DOI:10.1029/1999JB900351. ^ a b (2008) "Cenozoic evolution of the eastern Black Sea: A test of depth-dependent stretching models". Earth and Planetary Science Letters 265 (3–4): 360–378. DOI:10.1016/j.epsl.2007.10.033. ^ (2003) "The Black Sea basin: tectonic history and Neogene–Quaternary rapid subsidence modelling". Sedimentary Geology 156: 149–168. DOI:10.1016/S0037-0738(02)00286-5. ^ Remote Sensing of the European Seas. 2008. p. 17. ISBN 1-4020-6771-2. https://books.google.com/books?id=9B3D5-HBTzkC&pg=PA17. ^ Prothero, G.W. (1920). Anatolia. London: H.M. Stationery Office. http://www.wdl.org/en/item/11766/view/1/17/. ^ "Agriculture in the Black Sea Region". Bs-agro.com. http://bs-agro.com/index.php/about-us. Retrieved January 14, 2014. ^ "Meromictic". Merriam-webster.com. http://www.merriam-webster.com/dictionary/meromictic. Retrieved January 14, 2014. ^ "Exploring Ancient Mysteries: A Black Sea Journey". Ceoe.udel.edu. http://www.ceoe.udel.edu/blacksea/research/index.html. Retrieved January 14, 2014. ^ a b (2003) "Seasonal, interannual, and mesoscale variability of the Black Sea upper layer circulation derived from altimeter data". Journal of Geophysical Research 108. DOI:10.1029/2002JC001508. ^ Black Sea Becomes Turquoise earthobservatory.nasa.gov. Retrieved December 2, 2006. Archived October 28, 2008 at the Wayback Machine. ^ (2006) "Asteroid impact in the Black Sea. Death by drowning or asphyxiation?". Natural Hazards 40 (2): 327–338. DOI:10.1007/s11069-006-0017-7. ^ a b c d Oguz, T. (1999). "A physical-biochemical model of plankton productivity and nitrogen cycling in the Black Sea". Deep-Sea Research Part I 46 (4): 597–636. DOI:10.1016/S0967-0637(98)00074-0. ^ a b c (2006) "Factors controlling the summer Emiliania huxleyi bloom in the Black Sea: A modeling study". Journal of Marine Systems 59 (3–4): 173–188. DOI:10.1016/j.jmarsys.2005.08.002. ^ Friedrich, J. (2002). "Benthic Nutrient Cycling and Diagenetic Pathways in the North-western Black Sea". Estuarine, Coastal and Shelf Science 54 (3): 369–383. DOI:10.1006/ecss.2000.0653. ^ Eker, E. (1999). "Phytoplankton distribution in the western and eastern Black Sea in spring and autumn 1995". ICES Journal of Marine Science 56: 15–22. DOI:10.1006/jmsc.1999.0604. ^ a b (2003) "Distribution of phytoplankton in the southern Black Sea in summer 1996, spring and autumn 1998". Journal of Marine Systems 39 (3–4): 203–211. DOI:10.1016/S0924-7963(03)00031-9. ^ a b (2004) "An annotated checklist of dinoflagellates in the Black Sea". Hydrobiologia 517 (1): 43–59. DOI:10.1023/B:HYDR.0000027336.05452.07. ^ (2006) "Vertical distribution of marine cyanobacteria Synechococcus spp. in the Black, Marmara, Aegean, and eastern Mediterranean seas". Deep-Sea Research Part II 53 (17–19): 1976–1987. DOI:10.1016/j.dsr2.2006.03.016. ^ (2015) "Monachus monachus". IUCN Red List of Threatened Species 2015. Retrieved on 25 December 2015. ^ a b (2003) "Current knowledge of the cetacean fauna of the Greek Seas" (pdf). Journal of Cetacean Research and Management 5 (3): 219–232. Retrieved on 2016-04-21. ^ (1997) "Effect of Danube River dam on Black Sea biogeochemistry and ecosystem structure". Nature 386 (6623): 385–388. DOI:10.1038/386385a0. ^ Sburlea, A. (2006). "Aspects of eutrophication as a chemical pollution with implications on marine biota at the Romanian Black Sea shore". Chemicals as Intentional and Accidental Global Environmental Threats: 357–360. DOI:10.1007/978-1-4020-5098-5_28. ^ Gregoire, M. (2008). "Numerical modeling of the central Black Sea ecosystem functioning during the eutrophication phase". Progress in Oceanography 76 (3): 286–333. DOI:10.1016/j.pocean.2008.01.002. ^ Colin Woodard (February 11, 2001). Ocean's end: travels through endangered seas. Basic Books. pp. 1–28. ISBN 978-0-465-01571-9. https://books.google.com/books?id=QsVeUi_XbF4C&pg=PA1. Retrieved August 1, 2011. ^ (2002) "Modelling the Danube-influenced North-western Continental Shelf of the Black Sea. II: Ecosystem Response to Changes in Nutrient Delivery by the Danube River after its Damming in 1972". Estuarine, Coastal and Shelf Science 54 (3): 473–499. DOI:10.1006/ecss.2000.0659. ^ (1995) "Decadal Trends in the North Atlantic Oscillation: Regional Temperatures and Precipitation". Science 269 (5224): 676–679. DOI:10.1126/science.269.5224.676. PMID 17758812. ^ (2006) "Multicentennial-scale hydrological changes in the Black Sea and northern Red Sea during the Holocene and the Arctic/North Atlantic Oscillation". Paleoceanography 21. DOI:10.1029/2005PA001184. ^ "Spatial and temporal analysis of annual rainfall variations in Turkey". International Journal of Climatology 16: 1057–1076. DOI:<1057::AID-JOC75>3.3.CO;2-4 10.1002/(SICI)1097-0088(199609)16:9<1057::AID-JOC75>3.3.CO;2-4. ^ Cullen, H. M. (2002). "Impact of the North Atlantic Oscillation on Middle Eastern climate and streamflow". Climatic Change 55 (3): 315–338. DOI:10.1023/A:1020518305517. ^ (1997) "Oceanography of the Black Sea: A review of some recent results". Earth-Science Reviews 42 (4): 231–272. DOI:10.1016/S0012-8252(97)81859-4. ^ Wilford, John Noble (17 December 1996). "Geologists Link Black Sea Deluge To Farming's Rise". The New York Times. http://www.nytimes.com/1996/12/17/science/geologists-link-black-sea-deluge-to-farming-s-rise.html. Retrieved 17 June 2013. ^ David Nicolle (1989). The Venetian Empire 1200-1670. Osprey Publishing. p. 17. ISBN 978-0-85045-899-2. ^ Bruce McGowan. Economic Life in Ottoman Europe: Taxation, Trade and the Struggle for Land, 1600-1800, Studies in Modern Capitalism. p. 134. ISBN 978-0-521-13536-8. ^ "Black Sea Security". NATO Advanced Research Workshop. NATO. 2010. https://books.google.com/books?id=EfNxWxwDX0EC&pg=PA4&lpg=PA4&dq=traffic+on+the+black+sea&source=bl&ots=GfIlftezr-&sig=yEUW3Hrr4YKsy7oZ5alRXPeo2Sc&hl=en&sa=X&ei=PTRAU9_aCdWisAT2wIHAAg&ved=0CEsQ6AEwBTgK#v=snippet&q=traffic%20on%20the%20black%20sea&f=false. Retrieved 2010. ^ a b "Черное море признано одним из самых неблагоприятных мест для моряков". International Transport Workers' Federation. BlackSeaNews. May 27, 2013. http://www.blackseanews.net/read/64439. Retrieved September 20, 2013. ^ "Bulgarian Sea Resorts". http://www.bulgariansearesorts.com. Retrieved February 2, 2007. ^ "Montreaux and The Bosphorus Problem" (in tr). http://www.yeniansiklopedi.com/bogazlar-sorunu/%20. ^ "Montreaux Convention and Turkey (pdf)" (PDF). http://www.karalahana.com/kafkasya-politika-strateji/Montro_TR.pdf. West, Stephanie (2003). ‘The Most Marvellous of All Seas’: the Greek Encounter with the Euxine. 50. Greece & Rome. pp. 151–167. Petko Dimitrov; Dimitar Dimitrov (2004). THE BLACK SEA, THE FLOOD AND THE ANCIENT MYTHS. Varna. p. 91. ISBN 954-579-335-X. http://ice.tsu.ru/index.php?option=com_content&task=view&id=392&Itemid=88. Dimitrov, D (2010). Geology and Non-traditional resources of the Black Sea. LAP Lambert Academic Publishing. p. 244. ISBN 978-3-8383-8639-3. 1 Disputed statehood - partial international recognition, but considered by most countries to be Georgian territory. This page uses content from the English language Wikipedia. The original content was at Black Sea. The list of authors can be seen in the page history. As with this Familypedia wiki, the content of Wikipedia is available under the Creative Commons License.